Multi-instrumental music show created by performers Daniel Holdsworth and Aidan Roberts, dedicated to Mike Oldfield's iconic 1973 album, Tubular Bells - performed by just two men. "In this enthralling and highly entertaining theatrical event, Holdsworth and Roberts frantically juggle over twenty instruments to bring this influential masterpiece to life." 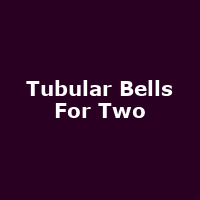 Thu 9th May 2019 Tubular Bells For TwoThe Anvil/ The Forge (Basingstoke)More Info..